David teaches in easy-to-apply steps his unique 'positive-reinforcement' training (clicker and discs) that has proved ideal for all dogs, cats, horses, birds and exotic pets. Together with specialised therapies to treat nervousness and aggression, this clear and effective method offers your pet non 'voice-dependent', signals to communicate caring control. His gentle, 'aggression-free' style brings out the best in all companion animals. 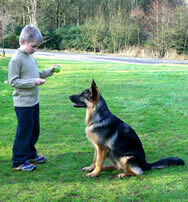 Clicker training uses positive-reinforcement of good behaviour. When your dog. Cat. Horse or parrot has displayed the correct behaviour you can signal and reward. This signal is not voice-dependant and can be successfully used by the whole family (tone of voice can vary between gender and age). Shouting will never help matters (that's barking, squawking to your pet) whereas the use of a sound that announces a reward (classical conditioning in Pavlov's pioneering work) can have the most positive results. The double sound of the 'clicker' will normally be unique to your pet. Dogs would not normally have existing 'association' to its sound. It may take several attempts to 'condition' your dog to associate the sound of the clicker to 'reward'. However, once your dog understands that the clicker is a 'signal for reward' he or she will respond without too much encouragement. Initially the reward should be food-based (small pieces of meat, dog treats etc) but eventually the reward can be a pat or a vocal congratulation GOOD boy, girl etc. 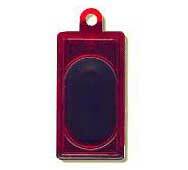 A set of fact sheets and two 'clickers' can be obtained directly from the Animal Behavioural Clinic, Chorley. Send cash, a cheque or postal order for £20 payable to Dr David Sands to the Animal Behavioural Clinic, 127 Blackburn Rd Heapey Chorley Lancs PR6 8EL. Please state whether a puppy, dog, cat or bird Clicker Information Sheet set is required. Discs are used to signal that you wish a particular behaviour to cease. 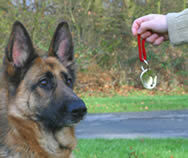 The use of discs, together with the removal or denial of reward, will teach your dog to stop a particular behaviour. The use of discs started with the late animal behaviourist John Fisher. He was looking for a simple, easy to make, sound that would signal to an animal that a particular behaviour was unacceptable and should cease (ie jumping up, growling etc). John helped to develop the five 50 mm-sized brass discs design, which are held together on a handy cord, and when shaken and dangled or dropped onto the ground, make a very distinctive sound. Once the pet has been conditioned to understand that the sound of the discs represent the 'removal of a reward' (the opposite to the clicker) they can be used as negative reinforcement. The discs are never used to scare the animal. Only to signal that a particular behaviour is not wanted. A set of fact sheets and 'discs' with a booklet can be obtained directly from the Animal Behavioural Clinic, Chorley. Send cash, a cheque or postal order for £15 payable to Dr David Sands to the Animal Behavioural Clinic, 127 Blackburn Rd Heapey Chorley Lancs PR6 8EL. Please state whether a puppy, dog, cat or bird Discs Information Sheet set is required.